SuperEQ (Shibatch Super Equalizer) is a graphic equalizer, originally created as a plugin for Winamp by Naoki Shibata. 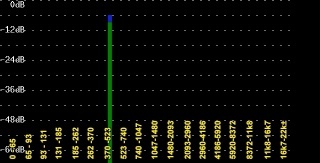 SuperEQ uses 16383th order FIR filters using FFT. Its equalization is very precise. Note that unlike traditional equalizers, there is very little roll-off or overlap between the bands. Source clip. Audio is always converted to Float. AVS+ no conversion is performed. Accepts Float audio only. Set EQ bands from a preset file (see Preset Files below). Set EQ bands within your script (see Band Gain Arguments below). 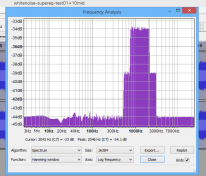 SuperEQ can accept a foobar2k equalizer Preset (.feq) file. Foobar's equalizer can be found in the DSPManager, and presets are adjusted and saved from there as well. A Preset file is a text file with a positive or negative integer on each line. Nothing else is allowed on the line, except white space. Empty (blank) lines are ignored. Each line sets the gain in decibels for a frequency band. All text after the first 18 non-empty lines is ignored, allowing you to add comments to the file. Preset files can be found in your \AviSynth\Examples folder (Equalizer Presets.zip), available online here, or may be found by searching the Web for "foobar2000 presets." From Avisynth version 2.60, band gain arguments allow all 18 bands to be set within your script, instead of requiring a preset file. The values are specified in decibels (in integer format). This is a rather extreme example of what can be done with SuperEQ. 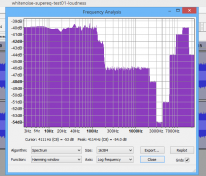 It implements a spectrum analyzer by displaying the audio level in each of SuperEQ's 18 frequency bands, using Histogram("audiolevels"). See this doom9.org thread for details. This filter is optimized for processors which have cache equal to or greater than 128k bytes (16383*2*sizeof(float) = 128k). This plugin won't work efficiently with K6 series processors. v2.61 The band gain arguments can only be int. It's now enforced as such. v2.60 Added custom band setting to allow all 16 bands to be set from script. Copyright © 2001-2003, Peter Pawlowski All rights reserved. This page was last modified on 6 July 2017, at 12:54.